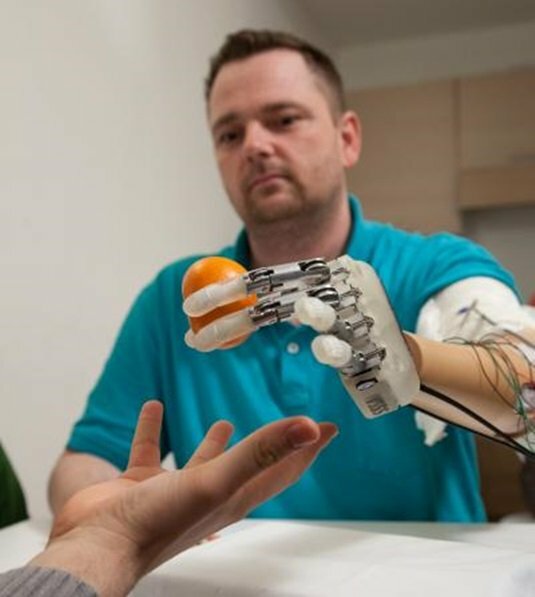 After years of research and hours of gruelling surgery, scientists have successfully attached sensors from a prosthetic hand to human nerve tissue to allow the device to give its wearer a sense of touch. "The sensory feedback was incredible," reported the test subject, Danish amputee Dennis Aabo Sørensen. "I could feel things that I hadn't been able to feel in over nine years. When I held an object, I could feel if it was soft or hard, round or square." A team for Swiss and Italian scientists added a feeling of touch by measuring the amount of movement needed to register sensation using artificial tendons and converting that into data that was refined into a signal human nerve sensors could understand. During a five-hour operation four electrodes were grafted onto the ulnar and median nerves in Sørensen's upper arm to enable the sense of touch. "We were worried about reduced sensitivity in Dennis' nerves since they hadn't been used in over nine years," says Stanisa Raspopovic, first author of the research paper about the operation published in the latest edition of edition of Science Translational Medicine. 19 days of testing were required to ensure incoming electronic signals would be properly recognized by the subject's nerves. But the system worked better than expected and the hand's fingertips were eventually capable of relaying accurate touch data back to the Dane, allowing him to feel from a prosthetic for the first time since losing his hand in a fireworks accident nine years ago. Sadly Sørensen will have to give up the touchy-feely device and go back to his normal prosthetic now that the experiment is over, but he said he was happy to take part in the experiment and was looking forward to new developments. He recounted that after losing his hand a doctor told him "there are two ways you can view this. You can sit in the corner and feel sorry for yourself. Or, you can get up and feel grateful for what you have. I believe you'll adopt the second view."